When approached by Rebecca Bruno to create costumes for her performance at HomeLA Passages at the Sowden House, inspiration ensued. My research revolved around the architecture of the famed house, the timeless glamour of 1920’s Hollywood, and the Bauhaus school’s approach to kinetic design. Lloyd Wright’s 1926 Sowden House is a flagship of California’s Mayan Revival Period. He created a unique system of modular and decorative concrete blocks. Each block was cast from sand found at the original site. For stability, the stacked blocks were locked into place using hidden reinforcement bars. Comparable to complex woven structures, the vertical bars act as the warp of the loom, while the weft-facing decorative stone pattern floats throughout the home, guiding the eye and the body. Following the two-dimensional design of the concrete blocks, I created a template to transfer the design onto semi-transparent poly-silk fabric in pillar-like formations. Alternating pillars were painted in a jade hue, while the remaining pillars were outlined in white paint or cut away leaving a negative space. Beneath it’s epic Pyramid-inspired facade, one enters the Sowden home through a large copper gate decorated with a jade-colored chevron pattern. Up the narrow staircase to the second floor, guests are confronted with a long pathway circumventing a rectangular courtyard. One end of the courtyard features an open living room, while the other steps up to a theatrical stage, with only sky separating the two. The symbolism and symmetry seen in the concrete blocks and sliding screens creates a textured separation of space and light. Many architectural motifs influenced the costume’s materials: Harvest, Water, Clouds, and Sun. Jade represents the aquatic and celestial worlds, Shell -mother of all waters, Gold - the Sun, and Stone - the powers of sky and rain. The costumes reflect each of these Mayan symbols in a different way. The white pillars and nylon net peplum represent the typical limestone pathways found in Yucatec Maya, called Sacbe. 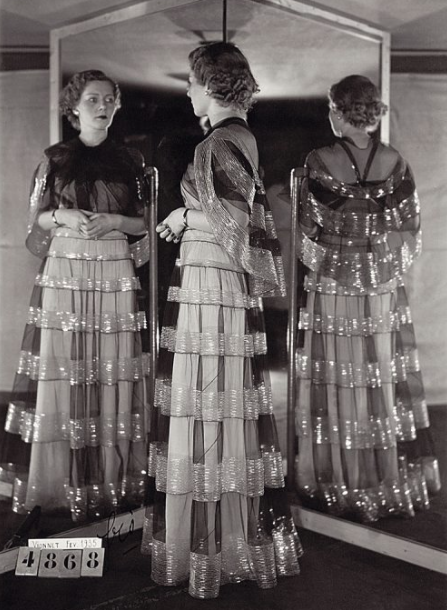 Madeleine Vionnet’s openwork textile techniques with semi-transparent fabric inspired the cut-work and painted-overlay textiles for the costume’s skirt and bodice. Jeanne Lanvin’s signature Robe de style silhouette was made popular in the mid-20’s. The drop-waist chemise dresses were accompanied by full skirts and supported by petticoats, panniers, or hoops emphasizing the hips. This iconic silhouette inspired the costume’s. This design left the dancers’ shoulders and legs visible for articulated choreography. In the 1920’s Oskar Schlemmer created his ballet of geometry, The Triadic Ballet. The movements emphasized the relationship between the mechanical body and the organic, primordial urges of the human figure in space. Knowing choreographer Rebecca Bruno had drawn inspiration from Schlemmer’s work, I tried to create geometric-yet-non-restrictive costumes for her dancers to move synchronistically within.